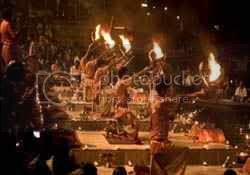 Varanasi is also known as Benaras or as Kashi which means the “City of Light”. It is one of the holiest city of Hindu’s and situated on the west bank of Ganges. This city is the City of Lord Shiva. Among the 12 Jyotirlinga, Varanasi is the foremost. There are almost 90 ghats along the bank of river Ganga and these ghats define the life and identity of the city. All the ghats together covers almost 6 Km which stretches from Asi Ghat in southern side to Adi Keshav Ghat on the northern side. These ghats are lined with many temples and shrines. They reverberate with the endless cycle of Hindu religious practice—-from daily rituals to profound rites of passage. The spiritual and religious legacy of the city goes back to nearly 3,000 years. It is among the oldest sites of Varanasi and initially it was known as Lolarka ghat. 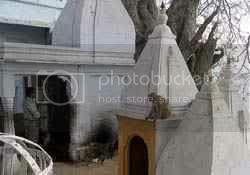 It was renamed as Tulsi Ghat in 16th century after the name of the great poet Tulsi Das who had lived here. There you can still find his house and temples there. It is the southernmost ghat of Varanasi where a linga stands beneath a papal tree. This marks the confluence of the Asi and Ganges rivers. Each ghat of Varanasi has its distinctive feature and the brick red steps of Janki Ghat distinguish it among all other ghats. In the mid 18th century Maharaja Chet Singh was defeated by the British and the fort on this ghat marks the spot of Raja Chet Singh’s defeat. Thousands of devotees come to this ghat which was founded by the Bengali female saint,Ananadmayi Ma. Maharaja Chet Singh who had ruled over Varanasi had built this ghat in 1770. The Ghats of Varanasi which are in the centre of the city are the most sacred ghats and most of them had been built by the rulers of many different princely states such as Darbhanga, Jaipur and Indore. This ghat is named after the temple of the Chausath Yoginis or more popularly known as 64 female divinities. At this ghat the lessons in the scriptures take place. This Ghat has many towers and turests of old havelis. It was built in the early 1990 by the two princes of Bihar and thetefore named as the Darbhanga Ghat. This ghat is dominated by these towers and turrets of old havelis. There are some massive pillars in these havelis which reminds one of the Greek style. At this ghat The ruler of Jaipur Jai Singh 2 had built one of his four Jantar Mantars in 1710. That Jantar mantar is above Raja Man Singh palace. 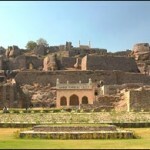 The Sundial of the palace is visible from the Ghat. 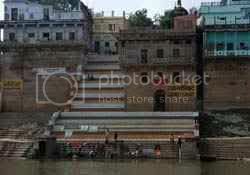 This Ghat is centrally located and is said to be the holiest spot of Varanasi. It is named after the ten simultaneous horse sacrifices which is said to be performed by Brahma the Creator here at this ghat. Here pilgrims swarm from different part of india to perform ritual prayers. There you can see the rows of priests sitting under bamboo parasols and they help the pilgrims in performing ritual prayers. As per the Hindu legend it is believed that dying in Varanasi is a cause of celebration for Hindus and they believe that those who die at Varanasi are bestowed instant salvation or Moksha that is the liberation from the cycle of birth and death.It is said that when anyone is dying at Varanasi then Shiva whispers into the ears of the dying and this is one of the main reason for every type of people coming here to breath their last whether they are old or infirm,sages or ordinary. 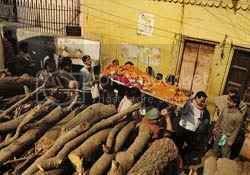 This is one of the cremation ghat of Varanasi and there you will find funeral pyre burning day and night. In the middle of the ghat there is a well or Kund which is said to be carved by Lord Vishnu with his discus before Ganga flowed here. There were very elaborate structures on this ghat but they were so heavy that they collapsed. They were rebuilt in 1937 by Daulat Rao Scindia of Gwalior and thus it is known as Scidia Ghat. At this ghat there is a temple which is half submerged in the river and its sanctum is in knee deep water. Apart from Ghats the evening aarti at these ghats are also something that attracts lots of pilgrims. Daily prayers or aarti is done at dawn and dusk which marks the salutation to the river Ganga. During the aarti bells are rung and sacred mantras are chanted. Oil lamps are offered to river to show ones gratitude to the river. 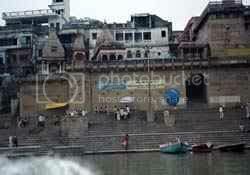 Though there are more than 700 temples in Varanasi but river Ganga is the most sacred. The Ganga river is worshipped as a goddess and it is believed that a dip in the river can cleanse all earthly sins of a person. 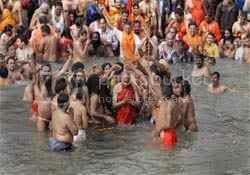 Daily thousands of pilgrims come to take the holy dip in the river and prey to the goddess ganga. Flwers are also offered to the river and you will always find diyas floating on the river. I am Susan Hannan from Exams Key; it gives 100% CRISC Test Questions exams. Let’s take benefit of 3600 Test Questions Exams material efficiently and get guaranteed success. Check out free demo of all certifications Exam. wow i like it. Very relegius city. many information abaout hindu i can get from your site. i`m realy sory about my english. is too bad! tq for information!